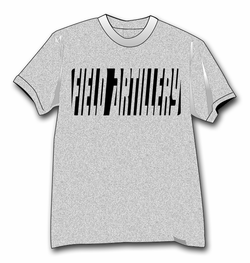 This Army Field Artillery T-Shirt is a Hanes softlink, Gray Poly/Cotton Pre-Shrunk. Vividly colored, long-wearing graphics on soft, comfortable t-shirt. Adult Sizes: S(34-36), M(38-40), L(42-44), XL(46-48). These designs are a ArmyDecals.com exclusive and are created at our facility in Scottsboro, AL. Each of these T-Shirts are a great addition to your collection or a great gift.